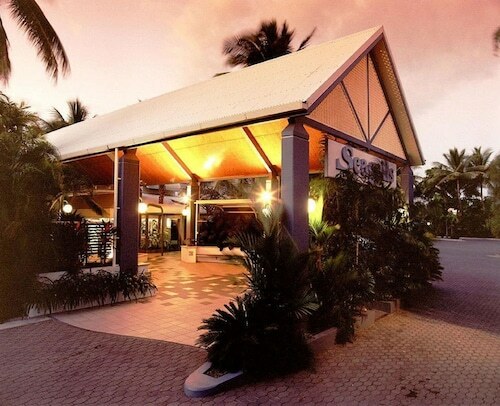 Offering direct access to the beach, this North Ward hotel is within 1 mi (2 km) of The Strand and Magnetic Island Ferry Terminal. Strand Park and Queens Gardens are also within 10 minutes. Situated in Rosslea, this motel is 1.1 mi (1.7 km) from Anderson Park Botanical Gardens and within 3 mi (5 km) of Townsville Museum and Historical Society and National Trust Heritage Centre. Cluden Racecourse and Catholic Diocese of Townsville are also within 3 mi (5 km). 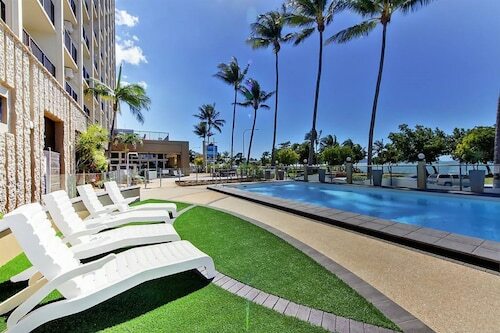 Located in the heart of Townsville, this luxury hotel is within 1 mi (2 km) of Catholic Diocese of Townsville and Magnetic Island Ferry Terminal. Perc Tucker Regional Gallery and Museum of Tropical Queensland are also within 15 minutes. Townsville Station is 16 minutes by foot. Situated near the airport, this luxury apartment building is steps from Tony Ireland Stadium and Riverway Lagoon. Willows Shopping Centre is 0.7 mi (1.2 km) away. Ah, Townsville, that sassy slice of paradise. When we say slice, we mean it—this seaside city stretches along Ross Creek and faces the Great Barrier Reef to the north. As for the sassy part, well, Townsville is a mix of fun-loving uni students, young professionals and long-time residents with energy to spare. Experience the city that keeps locals on the go as you strike out on riverside hikes and snorkelling excursions. But don’t get knackered on coastal activities without having awesome accommodation in Townsville where you can rest and recharge! How do I get to Townsville from the airport? Townsville Airport is an easy 6.5km commute east to the city centre. Pick up one of our car hire options or catch a bus from the nearby stop on Meenan Street at Halifax Street. You could even walk the whole way from the airport to your hotel, or just walk right into the Coral Sea for a refreshing dip. Townsville is small and full of gorgeous sights, so no matter where you plan to unpack your suitcase, it’s gonna be one of the best places to stay in Townsville. What are the most popular hotels in Townsville? What kinds of hotels are in Townsville? 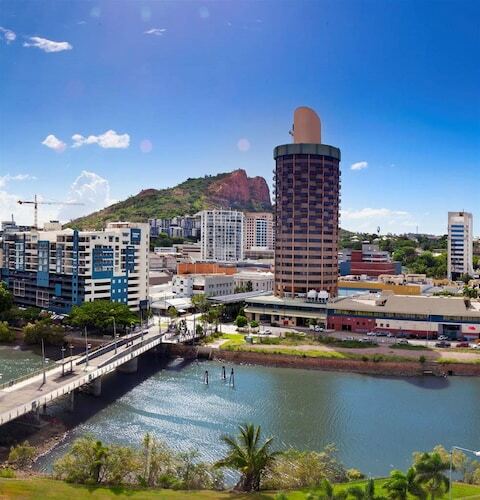 To stay within walking distance of the city’s top attractions, book your stay at the Grand Hotel and Apartments Townsville. Visit the Maritime Museum of Townsville and the Museum of Tropical Queensland, and walk to The Strand for sunbathing and snorkelling. 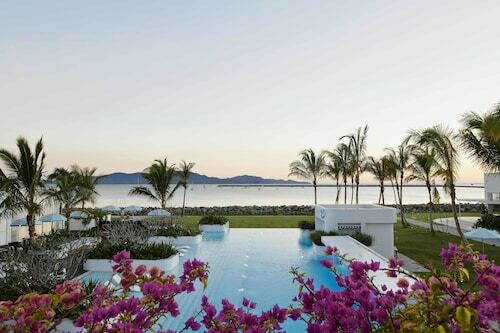 For island vibes, you don’t have to venture far from Townsville. 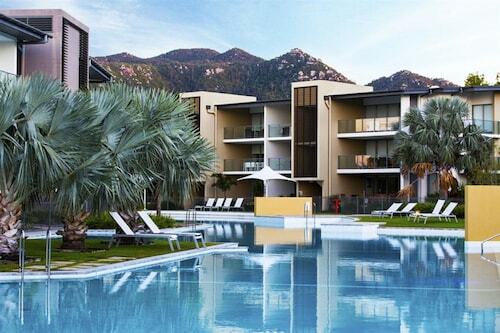 Stay at a luxury resort on Magnetic Island. Magnetic Sunsets Resort sits right on the shore of Horseshoe Bay, and it’s as romantic as candlelit dinners and long walks on the beach. Which can be arranged, in case you were wondering. Don’t break the bank! Book sweet Townsville hotel deals on super-affordable choices, like Cstay—a charming hostel with excellent amenities and a brilliant location on Magnetic Island. Where should I stay if I’m visiting Townsville? 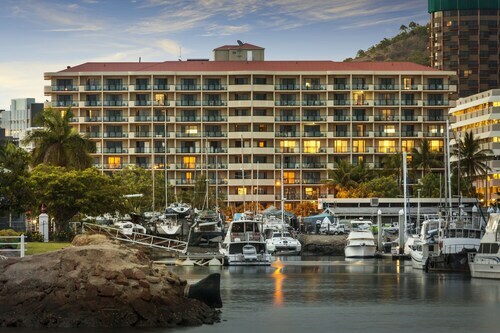 There are several hotels in Townsville and each of them is close to a waterfront or unique activities that make the city a fantastic holiday destination. Saturate yourself with sightseeing and beach time in the North Ward, Townsville’s oceanfront district. To look out over the Coral Sea like it’s no big deal, spend some time on Castle Hill and wave at Magnetic Island. If your idea of a stellar holiday involves walking to a new restaurant for every meal, then book your stay near the mouth of Ross Creek and pack an extra stomach. What are some things to do in Townsville? Sorry, you can’t get away from the water here—not that you’ll want to. Spend an arvo making new friends of the finned persuasion at Reef HQ Great Barrier Reef Aquarium. Love history and sea views? Visit the Jezzine Barracks, a heritage site for the local Aboriginal people and the Australian Army—located west of the Strand. Ready to float away on your dream trip? Book Townsville packages with Wotif and save extra on accommodation and airfares that are ready to go when you are. Wanna get a little crazy? 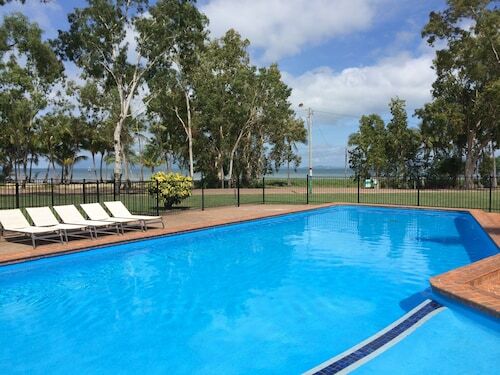 Book Cairns accommodation, too, and let the good times keep rolling. Need insider tips on must-see attractions in Townsville? 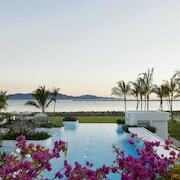 Check out our Townsville travel guide! How Much is a Hotel Room in Townsville? 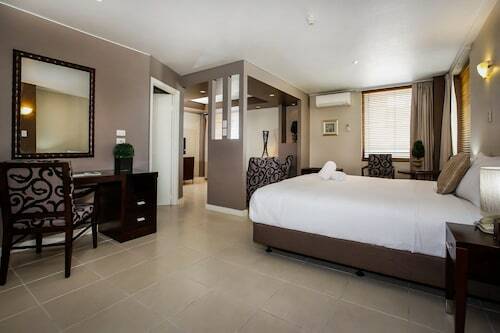 Hotels in Townsville start at AU$94 per night. Prices and availability subject to change. Additional terms may apply.